This activity allows students to explore how eyewitness testimony can make crucial contributions to the historical record. 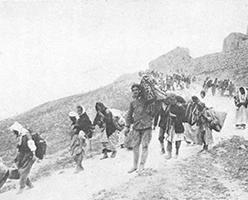 By closely examining primary sources from eyewitness accounts of the Armenian Genocide, they will consider the value of testimony and conventional documentation of atrocities. Students will demonstrate their understanding of the unique nature of testimony by creating a video journal. To gain comprehensive knowledge of the history of the Armenian Genocide, students may read "A Brief History of the Armenian Genocide" which can be downloaded in the Toolkit. Additionally, to gain more background on the UN official definition of the term genocide students may also download "UN Definition of Genocide" in the Toolkit.